A full day’s birding in the Adirondacks and along Lake Champlain on Tuesday with Will from The Nightjar was an absolute blast. We saw just over fifty species of bird and had a great time (and I added three birds to my New York State Big Year List). 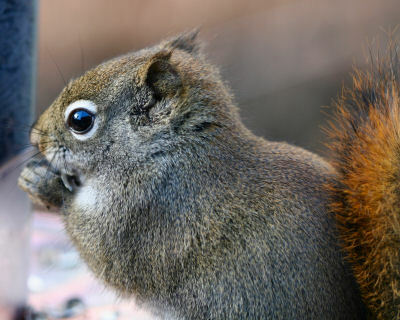 But this post isn’t about the birds; it’s about the American Red Squirrel (Tamiasciurus hudsonicus), one of two squirrels in the genus Tamiasciurus, or pine squirrels (the other is the Pacific Coast’s Douglas Squirrel). 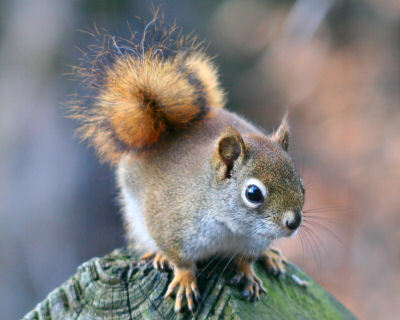 The American Red Squirrel is an entirely different creature than the similarly-named Eurasian Red Squirrel. The American Red Squirrels that chatter from every patch of evergreens in the Adirondacks are fearless little creatures and I love to watch their antics despite the fact that they are known to predate upon bird eggs and nestlings. 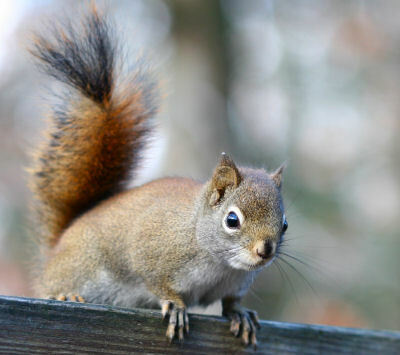 The particular squirrel pictured in this post was encountered at the feeders at the Newcomb Visitor Interpretive Center in the tiny town of Newcomb near the high-peaks section of the Adirondacks. Will and I had stopped there hoping to see Evening Grosbeaks at the feeders and instead found just squirrels and Black-capped Chickadees. Both species were amazingly unafraid. In fact, while crouched down to photograph a squirrel on the railing of the back porch at the interpretive center I got the distinct impression that the squirrel was considering a jump onto my head, an impression confirmed by Will who told me I was crazy to get so close. But how could something so cute mean me harm? No, seriously folks this critter was ready to defend its feeder, from other critters, chickadees and Corey. It would have made my soon-to-be written blog post more interesting if the Squirrel had in fact lept into Corey’s face. I asked him afterwards what he would have done. Corey’s response “If it landed on my head, I think I would have been Ok, but if it went for the face, I don’t know”. Either way I had my camera ready. That however was just an amsuing side story, the day really belonged to the birds… and good ones at that. Don’t ever – EVER – underestimate a red squirrel. Just trust me on this . . . 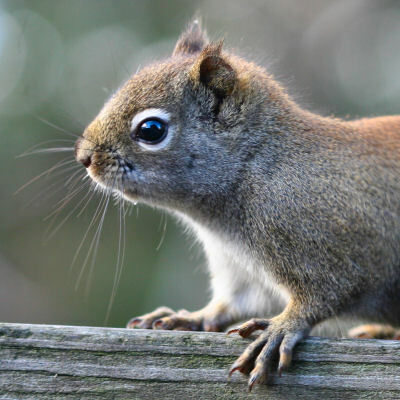 I saw what I thought was a chipmunk on steriods in my front yard this morning and immediately went on-line and found out he was a North American red squirrel. We have never seen them in Connecticut before, at least not here in Southington. I was very happy to read that they love pine trees, as I have quite a few in my yard. I was always relieved to learn that he was not a product of chipmunk/squirrel mating….that would be too weird. Thanks for the information and your beautiful website. @JoAnn: The thought of a chipmunk/squirrel mating is kind of scary. Glad you enjoyed the post and I hope you come back to visit us again! I had never seen a red squirrel before until about two weeks ago. Imagine our surprise as my daughter and I went walking on the upper trails of Roberts property in Bristol, opened to the public. We heard intense chattering and looked beyond an old picket fence. There, on a lower branch, was a red squirrel! I managed to snap one picture before he scampered off. I was surprised at his small size compared to a gray squirrel. I thought the same…a chipmunk and squirrel mating. I am wondering though if this little guy was the cause of all the new growth on my pine tree to fall off while gathering it’s seeds. It looks like someone stuck a mouse to a brush. I’ve lived in the Chatham NY area for 15 years and in the general area for 62 years and never saw a red squirrel until last winter when we set our bird feeders out. What I first thought was a lone squirrel now seems to be a family of 4 since they don’t seem to be in competition with each other. At first my wife and I worried that the much larger population of gray squirrels would run them off, but quite to the contrary the reds seem to rule the roost. They frequently charge out to challenge the grays before they are close to the food and have great success chasing off small to medium size grays. The larger grays that they can’t run off still seem to defer to them, waiting patiently on the fence rail till the reds are finished. Our area is much more deciduous than coniferous, but recently read that they are branching out into deciduous areas. Their fur seems to be much cleaner and better groomed than the grays regardless of the weather conditions. the red squirrels have moved into this area a couple of years ago. [ NE PA] they`ve chased away chippies and the greys. they got into my cellar this past winter and ate any mice that were there. [I wondered why I didn`t have any mice after january.] I blocked up their entry and now they`ve chewed another one. I need help in getting rid of them for good!!! looking for suggestions. thanks !! @Ann: I have no idea how one would get rid of a squirrel infestation. I’ve got the same problem as Ann. They moved into my mudroom last winter (we live in upstate NY)- they came in through the well pit and up through the walls. I’m pretty concerned. Any thoughts would be appreciated. Strange. It seems the red squirrels ventured into CT (I live in Bethany) last year. I had never seen one (in 64 years of a lot of outdoor activity) until last year. At first only 1 would show up at the bird feeder and then a 2nd. They continued to feed under the feeder thru the winter. This year there now seems to be 2 adults and 1 little guy. So now we have the grays (much fewer this year), the blacks, and now the reds. I live in San Antonio, TX. I saw my first red squirrel in my bird feeding area in 25 yrs. Today I saw a red squirrel. Although I’ve lived in South Windsor in the same house and worked in the same yard for 37 years, I had never seen one before today. Because it’s only a little bigger than a chipmunk, I thought it was a chipmunk, but its bushy tail and actions were all squirrel. Today, I was surprised. How nice! I have lived in Ridgefield, Ct, for 4 years and was surprised to see my first red squirrel this past week. It is smaller and zippier than the grey squirrels on the property and comes out later in the day (it’s 3 pm now). I have several bird feeders with squirrel guards, but only today has it ventured near them. Last week it was eating the tender ends of a small snow covered pine tree – which didn’t upset me much as I need to limit it sizewise anyway. It’s a voracious little critter and I’m a little surprised it hasn’t challenged my feeders, as I have read it is a great leaper. With the snow about 2 ft deep, my guards are quite a bit more accessible than during the warm months. We live in a Southeastern Wisconsin retirement complex and have what is called an inner garden (lovely piece of park completely surrounded by buildings. This is the first year that we have placed bird feeders and houses amount the crabapple trees. And lo and behold, we have a family of three American Red Squirrels. Never saw them in this part of the Midwest before. Enjoy their antics during dinner hours and have had a lively discussion on whether they are squirrels or funny-looking chipmunks (which thrive in WI). They definiely are tiny, lively, red squirrels. Hope they stay over the winter. We are definitely going to try. From Sault Ste Marie, Ont. I feed the birds in my back yard and got a major surprise today when we observed a red squirrel chase and kill a small bird at one of the feeder. A short time later, I watched the same red squirrel chase away a black squirrel, tear after a chipmunk and chase away a couple of pigeons and other birds. I am hoping this is only a mother seeking food and protecting a nest in a nearby nest. It was something to see it racing from tree to tree going to almost all of the feeders. It certainly would appear to be possessive of one of the feeders in particular.